As a result of recent advances diode laser technology is now the defacto standard for hair removal in all skin types. 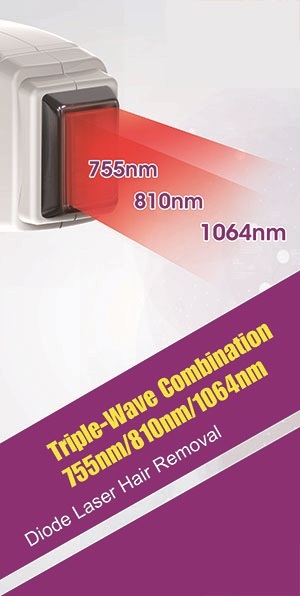 The availability of 755nm and 1064nm wavelength diode lasers now enables diode lasers to work at the optimum wavelength across the full spectrum of hair types from fine and light brown or grey hair (not white) to hair in type V and VI skin. TEC cooling of heads and water tank for improved reliability. It pays to have a big head when removing hair! At the time of writing our 40 x 23 mm diode head was the largest available anywhere. When removing hair from large areas there are significant advantages to having a large treatment head. 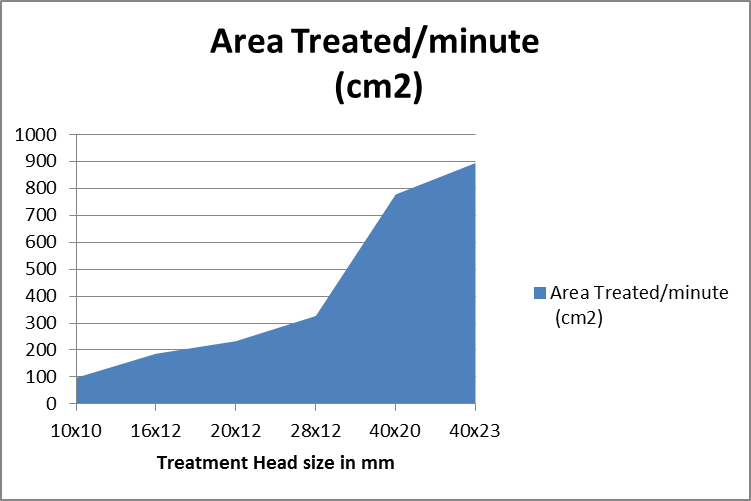 The graph shows the effect of treatment head size on the speed of treatment, when used in the Professional mode with the repetition rate set to 2Hz and the head being used to deliver single shots with an average overlap of 10%. 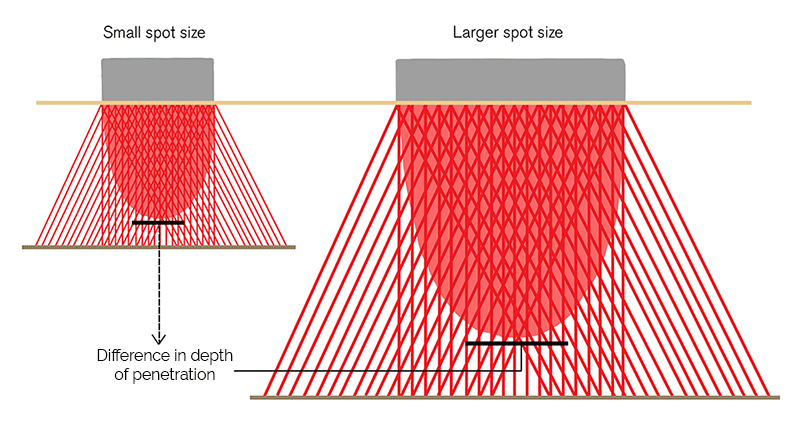 A 40 x 23mm head can be up to 5 times faster than a typical 20 x 10 size head. The larger spot reduces the effects of scatter which results in a greater depth of treatment for any given fluence, enabling the fluence to be reduced. A lower fluence is less likely to cause post treatment pigmentation changes, particularly important when treating skin types IV-VI. The higher treatment speed gives both you and your patients more time. Enabling you to be more flexible and treat more people and improve the quality of service. Preassembled diode stacks from the USA – most manufacturers will claim laser diodes from Germany or the USA but the assembly of these into stacks is a difficult and essential step in guaranteeing quality. Cambridge Stratum laser diode stacks are manufactured in the USA to the highest standards and we guarantee them for 10,000,000 shots. Whatever you need the Aluna Range has the optimum treatment head. With the introduction of 755nm and 1064nm wavelengths in addition to the standard and very flexible 810nm wavelength, the Aluna Range has rendered other types of hair removal obsolete. Advanced three stage cooling system utilising, cooled sapphire window, TEC cooling of the treatment heads and a 1kW TEC cooling module for the water reservoir/heat capacitor. SHR mode – when this mode is selected the operator is lead through a quick and easy selection process that will result in the setting of safe, pain free and effective parameters for the treatment. The SHR mode uses the constant motion stacking technique to heat the hair follicles within the treatment area. The parameters also include the total energy to be delivered to the treatment area and the machine will stop automatically when this level is reached. By using a series of smaller pulses rather than a single pulse the patient generally feels a gentle warming sensation. Stack mode – This is similar to the SHR mode in that it leads the operator through the same treatment selection process and uses a series (stack) of pulses to treat the hair. The difference is that the treatment head is held in one place and is very useful for more intricate areas such as bikini line or fingers and toes. It is also useful where precision is required. Professional mode – gives the experience operator full control of the number of shots/second (Hz), pulse duration (ms) and fluence ( ). Professional mode is also the fastest mode of treatment when using the larger treatment head. E.g by using the stamping method, with the 40 x 23 mm head at 2Hz an average size man’s back can be treatment in under 4 minutes. Machine control provided by ARM processor developed in Cambridge, England running the Android operation system proven in millions of devices worldwide. 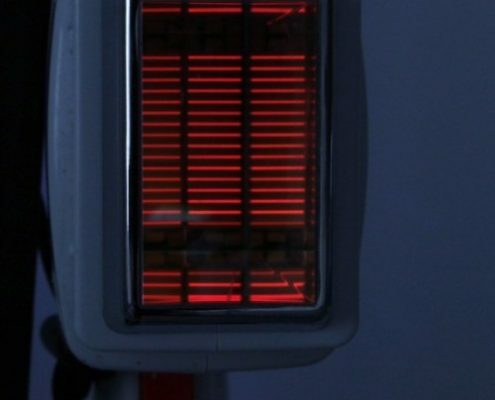 Thermoelectric cooling is used to cool both the treatment head and the main machine. 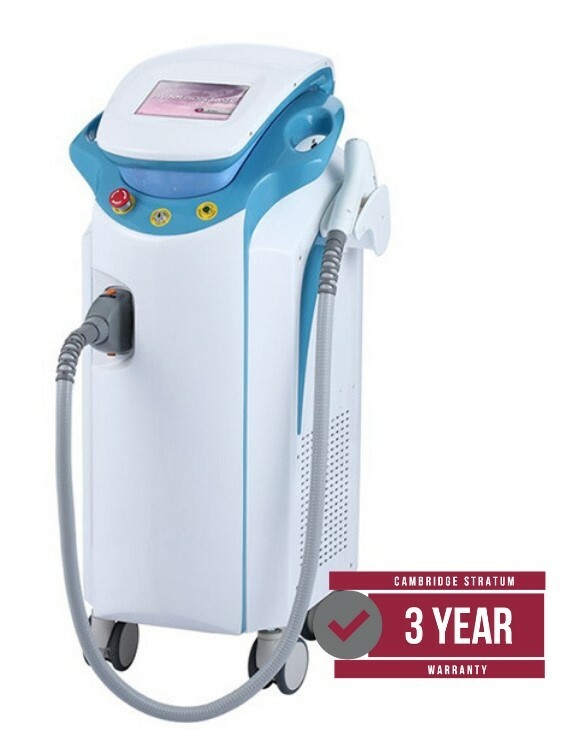 By eliminating many moving parts we have improved the overall system reliability and the efficient cooling of the treatment head not only extends the life of the diode lasers, it is a major contributor to patient comfort. The cooling systems also have both standard water filters and ion filters to maintain the quality of the water and the cooling efficiency. All machines have been tested and approved for UK main voltage of 240V and up to 264V to allow for variations. Please note – many Chinese manufacturers only test for operation at 110V and 220V, which can lead to unreliability at UK voltages.